Physical characteristics: Spangled contingas are 8.5-inch (22-centimeter) long birds that live in the rainforest. The males are brightly colored. Their backs are brilliant turquoise blue spattered with black. They have black wings, a black tail, and a large purple patch under their throat. The females are dull, with dark brown backs and light brown, spotted breasts. 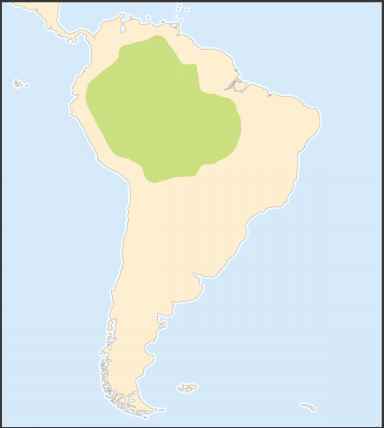 Geographic range: Spangled cotingas are found in the Amazon River basin of Brazil, the rainforest of Venezuela, French Guiana, Guyuana, eastern Colombia, and northwestern Bolivia. Habitat: Spangled cotingas live in the canopy under the treetops of lowland rainforests, rarely above 2,000 feet (600 meters) in elevation. 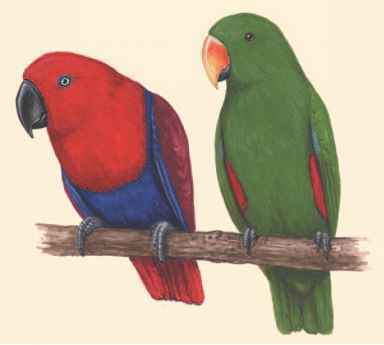 Diet: Like all cotingas, these birds prefer fruit and berries. 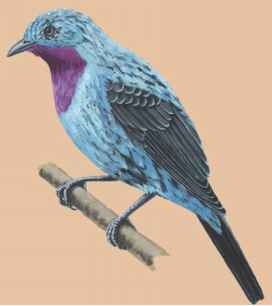 They often search for food in the same trees as other members of the cotinga family. Behavior and reproduction: Not much is known about the mating behavior of spangled cotingas, however, it is believed that they form loose leks during the mating season. During courtship, males often spread themselves flat along a branch, moving their wings and calling to females. Females build loose platform nests of sticks in the tops of trees and care for the young alone. Spangled cotingas and people: These birds are hunted for their feathers, which are used in making flies for fishing and as decoration by native tribes.